A career ago, I took promotion to conductor at Bayshore Yard, and the only question asked of me during the oral examination was: Where can you find a company officer 24 hours per day? I admitted that I was stumped, not saying that I believed that most managers kept bankers' hours. The correct answer was: at the chief dispatcher's office. This was all well and good, I responded, but what do I do in that moment of dire necessity that comes when I'm out of Motorola radio range from the chief? The officer allowed that I was probably out of luck, but added that, We still have some call booths, I think. Yes, those concrete outhouses (literally - for the homeless) still littered the Coast Division in profusion, most of them being many years past their originally intended function. I never found one in operating condition , until I transferred to Tucumcari, New Mexico in 1984. 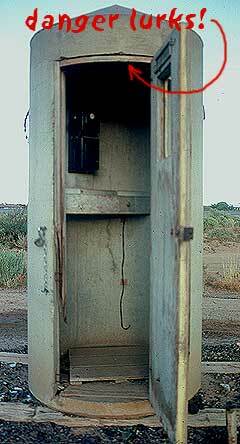 There, most sidings still featured a telephone booth at one end, all supposedly connected to the dispatcher in Tucson. As things seldom went as planned out of Tucumcari, crews had frequent cause to contact the dispatcher to revamp game plans. After the demise of train order dispatching at mid-year, everything was handled via radio, using the same crummy Motorolas that were the bane of railroaders everywhere. The extra bonus was that this portion of New Mexico is hill-'n-dale, replete with dead spots where even the best radios are useless. So, when a crew was out of running authority and out of radio range, what could they do in those days before cell phones and better radio setups? First, have the caboose try their radio. Second, take the radio handset on the lead loco back through the units in a search for a more powerful transmitter (HAH!). Third, move the train ahead, or back, out of the dead spot. In that land of rattlesnakes and other fearsome varmits, most employees used these wildlife condominiums with considerable trepidation. My conductor, Sammy Gholson, flatly refused to use them, instead delegating the task to the rear brakeman: me. The first time this happened, Sammy spent several minutes giving me prior instruction, but not upon the peculiarities of that particular booth's telephone jury-rig, for of course he had no first-hand knowledge of that. Nope, we thoroughly explored safety issues relating to small animal husbandry. In doing so, Sammy mentioned the cause of his phobia. Early in his career (a.k.a., steam engine days), Sammy had passed through a booth doorway without taking precautions, only to have a live rattler drop off of the door frame onto his head! Thus, after cracking the door and throwing in the fusee to gas the wildlife, beyond giving sufficient time for the fumes to do their work, the main thing was that, prior to entry, you always used a stick or something to dislodge snoozing snakes from above the doorway. I should note here that twenty years hence, on a railroad that is less than 50 miles long, I sometimes wish for the reactivation of the concrete bunkers, because those stupid Motorolas still don't work worth a darn. But hey, overtime pays the most! Readers may note that the floor in the picture has not been incinerated by fusees, indicating a paucity of rattlesnakes in the Alamagordo, N.M. city limits (1983). The dangling wire inside is not a good sign, although it was fully hooked-up on the outside. Wx4 notes that this, and several of our other second-rate phone booth pics were rejected by Editor Signor for the aforementioned SP Trainline article. Well John, second-rate is good enough for Wx4, by golly!